If you’re just tuning in to this installment of the DD Women’s Series, you’re in for a treat. Last week we talked with Tina Stanaitis and learned about how she started her successful company, WhaleSacs, and turned her dream of touring professionally into a reality. Take a moment to check it out for some great tips and motivational words of wisdom. 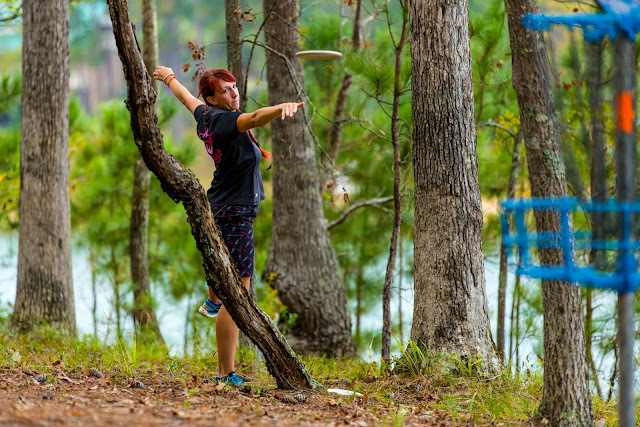 In Part 2, we get a little deeper into what life is like for a disc golfer who’s on the road more often than at home and gain some insight into what challenges can come up for a woman who does it on her own. Buckle up, because this blog is about to get real! “I can’t tell you how many times people were skeptical that I bought an RV and lived in it alone,” Tina said with a laugh. Not one to dance around a topic, Stanaitis was very straightforward and honest when we talked with her about how she went on tour by herself. Although we now see her as one half of the WhalePants team, during the beginning of her professional career she was on the road solo. While Eric and Tina's RV seems to be a staple everywhere you look, the first leg of Tina’s journey was actually done in something a bit smaller. “I did half a year in a Prius on tour by myself,” she shared and noted that others were constantly surprised when they heard about what she was doing it. A former banker, Tina wasn’t quite used to living out of a car but said it became the norm after a little while. Upgrading to an RV was certainly a luxury, yet that didn’t mean the road ahead was all smooth sailing. A mere two weeks after moving into her new digs, Tina was robbed. Despite some hesitation about how others viewed her reaction to the event, she stands firm that her personal safety is far more important than trying to confront an intruder. Does Gender Really Play A Role? You might be asking yourself how any of this is related to being a woman, and without stepping on anyone’s toes, it might be something to decide for yourself. However one thing’s for certain: far fewer men encounter skepticism, extreme concern, and weird looks when they talk about going on tour than women do. Truer words were never spoken! Next week we’ll talk with Tina about her strategies for practicing with other women and how being on the road has helped her game. This is a nice series. When it's finished, it would be cool to stitch it together and flesh it out more as a single longform piece.